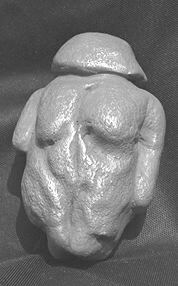 Here is the photo of the slick commercial replica of the Berekhat Ram Figurine, that one can find displayed on many web sites, and that I had originally displayed on the "Enhanced Natural Phenomena" Web Page. Next to it is a photo of the genuine object. Older than 230,000 BP, Homo Erectus or Archaic Homo Sapiens !! After much searching I finally succeeded in finding that photo of the genuine object in "The Cambridge Illustrated History of Prehistoric Art" by Paul G Bahn, published in 1998 by the Cambridge University Press. What a pleasure and inspiration to view this book's many illustrations, and reading the text. You can click on the photo of the commercial replica to view its source. Looking at the two photo's side by side it is immediately aparent that the features of the genuine object are less anthropomorphic from our viewpoint. Compare the rough texture and dark color of the tuff with the smooth texture and light coloring of the replica. This smoothness and light color are very misleading, because we associate it with femininity !! Homo Erectus, however, was probably dark skinned and still very hairy, and would most likely have had a very different opinion. Beware, we tend to impose our twentieth century sensibilities !! 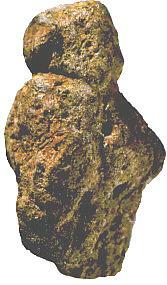 UPDATE This figurine has been studied in detail by Dr. Francesco d'Errico (Institut de Prehistoire et de Geologie du Quaternaire, Talence, France) and April Nowell (University of Pensylvania). An article was published on the Sept.25, 2000 issue of the National Geographic News. Unfortunately there are no photos accompanying this article.